College student Sun Xia (left) and graduate Hao Chengbing works at a butcher shop on Tianshan Road. WHILE her classmates are still studying logistics at Hainan University, Sun Xia, 22, chose a different path in life, slicing pork with a butcher knife at a food market in Shanghai. 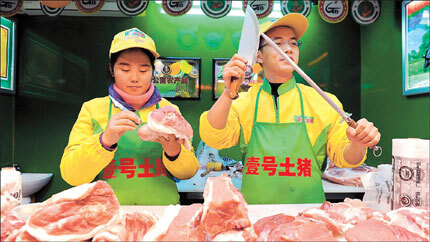 Sun, an Anhui Province native, is among more than 50 university students or graduates who decided to start a job as butchers or their assistants at 12 chain butcher shops at the city’s food markets. It’s the type of choice that may not meet the approval of some parents, who think their children should choose a white-collar job. "My mother was not satisfied after I took the job as she seemingly cannot connect a young woman with being a butcher," said Sun. "Fortunately, my boyfriend said he was fine with my job." Sun said she took the job because it is "quite stable and promising." "There is a huge market demand for pork and in the future the demand will surely be high," Sun said. She said she may earn about 2,500 yuan ($US401.68) per month during her internship, while some can more than 5,000 yuan if they are promoted to management. The students said they were trained in handling meat for more than a month before they were sent to jobs. They learned to slice pork and promote their products to customers. At the No. 1 Tuzhu shop on Tianshan Road in Changning District, Sun was working with another butcher, holding two knives in both hands and skillfully mincing pork for their customers. Although the food market is always filled with the strong smells of smoke, seafood, and traditional Chinese medicine, Sun said she enjoys the job, which brings her into contact with customers. "I took an office internship but the work is just so boring that the only thing you can do is to surf the Internet, staring on your computer screen," said Sun. She believed that selling or slicing pork in the food market is much more challenging and interesting. "Back at the butchers’ school, we have to learn slicing skills by practicing on pieces of wood. After practicing for a long time, I gradually learned that slicing doesn’t mainly depend on how much physical power you have, but the skills of using your wrist wisely," said Sun. To cut the pork into pleasing shapes that customers would choose to buy is a great art and skill that can earn more profit for the company, Sun said. She said at the school they have also learned how to recognize each part of a pig because various parts are sold at different prices. "It’s funny that the teacher taught us to feel our own bodies if we cannot tell which part the piece of pork is. That trick works very often," said Sun. While assisting the butcher in the shop is part of Sun’s job, another tough part of her work is to persuade the customers to buy high-quality products, which can be pricier. To attract customers, Sun has even prepared a "small kitchen" in the shop, making pork bone soup herself every day and serving it to her customers free of charge. "It is one of many ideas that we are taught to run a butcher shop with a quick mind," said Sun. The chain stores are owned by Chen Sheng, a graduate of Peking University who reportedly uses advanced management and marketing ideas to sell pork.